We are currently working in our marketing strategy and a question came up with our team. What is the tipical time a listing takes to sell /rent when using a matterport 3d virtual tour compared to a listing without virtual tour? Example Answer: On average it took 10 visits to a listing to sell/rent, with virtual tour it now takes around 5 visits to a listing to sell/rent, this last is posible because virtual tours enable better qualified visitors to listings. Example Answer 2: Realtors have notice that with matterport 3d virtual tours a typical listing is sold in half the time compared to a listing without virtual tours, these is posible because a listing is more exposed and the potential buyers/renters that show interest in the listing are better qualified to end up buying/renting than listings without a virtual. Im just stating my business in Colombia, so any coments about stats you have collected from Realtors and your experiences would really help to improve my SALES PITCH. That's a great question but a loaded one. There are too many variables in selling real estate that cannot be overshadowed by a 3D tour. I would steer clear from making claims that listings "Sell" faster or for more, since you have no control over the list price and market. I think you should provide it to a few realtor's at a discounted rate and ask them to provide the feedback and recommendations/testimonials for you to refine your marketing plan. In my area, one realtor said after putting the house on the market with this he had the most showing's he has had in the first week, compared to any other property he's listed. Do some more market research on the needs of the realtors in your area and find out what needs you can help fill with your product. Here's the review from one of my clients in SoCal. We hired Carlos at Tour It Now to create 3D tours on three of our new listings. This new technology is cutting-edge for the real estate industry, and it gives potential buyers a great tool to preview a home. Since we started using 3D tours, we’ve seen a marked increase in actual buyer showings, and all three of the homes went under contract within two weeks each. I also was able to secure an $850,000 listing recently, and a heavy portion of our interview included a discussion about the 3D tours we provide. The sellers were wowed! I’ve been watching this technology since it debuted over a year ago. But until recently, it just wasn’t affordable for our median sale price. Until now, anyway. Tour It Now’s prices are not that much more than we were spending for photos and videos. I would recommend Carlos and Tour It Now’s services to any listing agent out there who wants to show the home well and sell it faster. @CarlosFHdz Great stuff Carlos. These is exactly the kind of input im looking for. Thanks for sharing! @DanSmigrod thanks for sharing. I really enjoyed the video. More stuff to improve my pitch. Every day that passes by and a home owners listing is not sold or rent, the cost of oportunity is equal to aproximately 1 day rent (Even if your buying or renting). Said another way, the home owner is not receiving aproximately 1 day rent for every day that passes by, without renting or selling his home. If Matterport virtual tour service speeds up the selling/renting process, it would take just a few days to justify the investment. With the above math, if we help the home owner sell/rent the house 7 days faster with matterport technology compared to traditional selling tecniques (2d photos capture with smartphone or regular camera by the home owner) and operation (less qualified leads which lead to additional listing visits), the home owner would be having a positive return in his investment. @DanSmigrod and MUG community, would you agree with the above? @alegonzabot I your 'calculator' ... perhaps you or a Forum member could turn it into a dynamic calculator that can be embedded into our websites? 1. once with the names of the values? 2. once with the numbers in the example? I had a "For Sale by Owner" reach out to me yesterday. I will follow-up with the custom numbers for his listing. While I have written a blog post from the homeowners perspective, I stay focused on luxury real estate agents since that's recurring revenue. I thought I did see some stats out there that listings with professional photos sell faster though. Then again, a photo only shows what the photographer wants you to see. A MP tour is less forgiving as you get to really see the house in real time. It could be argued that a potential buyer would view the tour and then decide the house is not really for them after all because they don't like the layout, etc. @bryn was working on a Spreadsheet where we could enter sales data for homes we've scanned to start to make this case with actual data. I don't think it's gone anywhere, but maybe we should revive the effort. The trick is to figure out how to get good unbiased comp data. It's not too hard to select a set of comps to make out listings look like they sell for more money and more quickly than their comps. The best way (for trustworthy data, at least) would be for someone to hire someone unbiased to put together this data for a bunch of scans with 3D Showcases. @desireebyrd This is an interesting point you bring up and one that we discussed without any resolution prior to purchasing the MP camera. A discrete photo might bring someone to the property to explore it--but could the ability to view the entire home online keep someone away? And if it did, would they have been as disinterested had they seen the property in person? @alegonzabot Sales data are tricky and many vendors of different marketing products and techniques are stating how theirs will close the sale. It will be interesting to see your results. @dessireebyrd , I agree about a potential buyer deciding they don't like the layout based on a virtual walkthrough with a MP showcase, and I'm sure as an agent, you'd rather the buyer make that decision before they go the property and see the layout and say they don't like it there. Saved time= saved money. It's a double edged sword though. Real estate agents understand that and they won't use this technology on homes that won't show well. Have you seen or scanned a property that made you think? why would they scan this place? Personally, I've only seen one scan online that a realtor did that made me question their decision to provide the 3D tour on that property and it's current condition. @mikesobay , certain online photo's draw buyers to see a property only to be disappointed by the reality. MP draws buyers to see a home if they liked the 3d tour, and I think if they like what they see online, they want to confirm their opinion by actually visiting it, at least in my experience. Also, in certain markets their is a huge potential for vacation rental/second homes where it's ideal to see a home online and making the decision before flying out there or driving more than an hour to see it. That grows the amount of showings a home like that would get, more eyes on the property, right price, more likely the right person will see it who likes it. Here is the link to the Wall street journal article for photography helping sell real estate for more. 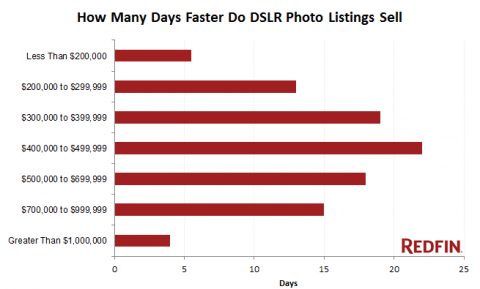 These stats show that that listings with professional photos sell faster. If a property is sold 6 days faster with matter port tech, the return in investment is positive. @alegonzabot Thank you. I sent off the formula and a custom estimate for a homeowner in Atlanta. @DanSmigrod Awesome! If posible, share with us the home owner reaction to these kind of sales pitch. Check these stats from REDFIN. For each price range, the days indicate how much faster a professionally photographed home sold compared to a home with amateur photos. These info + the MATH above will defenetly help you close the sell. "Calculation is great if looked in isolation and 3D walkthrough is the only factor to be considered." @alegonzabot Yes! That's the point! "House sale has other aspects to it as well, I am getting with a listing agent this weekend to finalize the process and I will ask him to absorb 3D walk through cost." Sounds great to me. My guess is that your formula really drove home the point. It's a big $$$ house, so it doesn't take many days to get the ROI. Much better to position how we will help the homeowner generate revenue rather than expense. Realtors could add this to their pitch. Fewer days on market lets you move on in your life and save/make money. @DanSmigrod "Much better to position how we will help the homeowner generate revenue rather than expense." These is exactly what we need to aim for! The matterport immersion photography system permits the viewer to walk thru a property in any direction or fashion. The Buyer can control their time and direction on site. THE seller benefits in having MORE qualified prospects through their home [on weekends and evenings] thus enriching their free family time with fewer dis interested or unprepared buyers. How easy for the listing agent to ask; Have you viewed the 3D virtual tour prior to your personal inspection? The Home Seller is not dealing with ROI, they are dealing with Kids, a wife, soccer practice and access to their home. They need to sell. You solve a speed access challenge with this technology. @davidpylyp thanks for sharing. I think that in every purchasing desicion there are different types of buyers. Some will focus there atention in ROI others will focus there atention in quality time they gain. And other buyers will focus on other things. A good sales pitch has to make a wide spectrum of type of buyers feel comfortable and let them know they are making the right desicion of making the purchase. The RedFin stats are interesting.. I've been working on our stats based on the properties we've done so far however I'm not ready to release them until the sample size is larger. -Demonstrating VR is very memorable, and everyone will be talking about it. While it may not be 100% practical yet, it sure is a great way to get people to remember you. For each home sale 60% of the sales process is completed online and 90% of the home search is conducted online making it the predominate way that people are interacting with real estate listings. Increasingly buyers are turning to digital with more half of first time buyers starting their search online and 43% of all buyers found the home they bought online. Additionally mobile devices are playing a larger role in the search and online interaction. information gathered from August 2014 - June 2015 by Brandon Doyle (REALTOR) including interviews of Buyers & Sellers, and statics of actual listings compared to current market averages, as well as other personal listings with out Digital Showings. I will release the full notes & stats after Inman Connect in August by then I'll have a full year of use and plenty of data to benchmark. @DoyleRealtor , That's amazing insight! great job, great post! Thanks for your hard work in this space! If you're in near MN, and not busy tomorrow check out NAR Tech Edge. I'll be going in depth and discussing Matterport, Toursler, VR, the future, and how agents are already implementing the technology in their businesses.